Over the summer Henry expressed interest in making some friends. I tried to start working with him on some things he could do to help him in that area. He said it felt like too much work and it just wasn’t worth it. Sure. I get it. We let it go. But as middle school got underway, we felt we needed to address this topic again with him. Our hope was that if he had just one friend, someone he could connect with, it would help him deal with any teasing or bullying. Then we learned that Easter Seals Midwest has a program called PEERS. It’s a curriculum based on the book by Elizabeth A. Laugeson called, The Science of Making Friends: Helping Socially Challenged Teens and Young Adults. They had a session that started in January. Henry was ready to try the program and was quite excited about the class. They have homework every week such as making or receiving a phone call or having a “hangout” with someone. And he has really embraced it! He’s doing great! Until this latest chapter. They’ve been talking about how to deal with teasing and working on ignoring or pretending they don’t care. Henry just cannot “ignore”. Like, we can’t even say that word because he freaks out. So, now they are working on being able to tease-the-tease. What are things they can say back to someone without actually saying something negative about the teaser. Such as, “Hey Henry, your shoes are so stupid.” Henry could say, “Yeah, whatever.” Or “Why do you care about my shoes?” Also, they are learning physical actions they can do that would suggest to the teaser that they do not care. (ie shrugging shoulders, eye roll, etc.) To practice these things, BDC thought it would be a good idea do some role-playing with him. Fantastic! I can work with him on this! Sweet Sister Mary Francis Josephine!!!! My brain hurts. The whole idea of the point of role-play is not a concept he seems to be able to grasp. At all. Nope. It did not matter how I explained it or tried to demonstrate the exercise, he just couldn’t do it. I even had him try to tease me so I could show him some examples. He ended up so emotional he cried about it because he said he didn’t want to make fun of me. Or my hair, or my shoes, or socks or my glasses…even though I repeatedly let him know that I knew he didn’t mean it. Ok. Fine. I switched it back to him and asked him what he would say if someone told him his shoes were stupid? His response was, “Well, no one would make fun of my shoes, mom.” Alrighty. What if someone made fun of your shirt? Tears welled up in his eyes and said that someone had done that to him and now he was all emotional again because I triggered it. It didn’t matter if I tried this in first person, second person, third person or fourth person. Either I triggered him with a scenario or the scenario I gave “would never happen”. I need a drink. And I’m not talking about a drink of water. Good gods, give me strength!!! This continues for 45 minutes. FORTY-FIVE minutes! If I shared with you every scenario and approach to it that I tried with him I’d end up with at least 100 pages of material. If I shared with you every response that Henry gave me, we’d have at least 500 pages of material. Ok, maybe not that much. But it sure as hell felt like that much! And so where did this get us? The same place we started. We began at point A and ended at point A. I may have failed as a parent on this one but by gods I tried. I really, really tried. I’m just going to toss this one back on the PEERS instructor and weep while I get that drink. I’m just now getting Henry’s Halloween costume ready. I’d like to say that he is a last-minute-decider but more accurately I am a last-minute put-it-together-er. For those who may not know, I am not a Halloween costume person. At all. I don’t sew, or pin or Velcro and only on rare occasions do I hot glue. I am not creative or crafty when it comes to that kind of stuff. “You’re goin’ old school, huh? Really? Just a plain white sheet? Are you sure?” I can hardly believe it! So we finally made the trek to a nearby resale shop. Because no way am I buying a new set of white sheets. “go big or go home” does NOT in any way amount to 800 thread count Egyptian cotton. Not in my house. Unless, of course, I can’t find anything else in the 45 minutes I’ve allotted to shop for said sheet. Then I’ll sell my soul if I have too. As we peruse the Bed & Bath section, I see a lot of sheets. All with patterns, of course. Not one plain white. But then I spot it! One all white, king-sized dust ruffle for $3.99! Sweet goddess, thank you! It’s a Halloween miracle, folks! Now all I have to do is cut off the “ruffle” along the bottom, and holes for Henry’s face and hands. And I’ve still got 3 days to do it. But you can pretty much bet that I’ll be cutting Sunday night. I am ever so grateful that my son appreciates the classics! It was when Henry was 4 years old that we got the medical diagnosis of autism. It wasn’t so much a shock as it was an overwhelming wave. We began O.T., integration therapy and speech therapy almost immediately and we started looking at his preschool to screen for an educational diagnosis. I tried to read as much as I could about autism therapies, attended conferences and workshops. There are a lot of “therapies” out there. I knew that beginning a therapy program earlier rather than later was important. I also knew in my gut that whatever route we chose it would be essential that it fit with Henry’s personality and learning style. Also, realistically, it was going to have to fit in with our families lifestyle and personalities as well. If we couldn’t have the consistency at home as in a therapy setting, over the long haul, and as we all know, this haul is LONG, what good would it do? A few seemed they could be quite helpful. Many had that “too good to be true” feeling about them. And still others had “sham” written all over it. In the small print, between the lines…in invisible ink. I was trying my best to educate myself so that we could make an informed, intelligent decision on what might best help Henry. It was terrifying. Our pediatrician, who diagnosed Henry, encouraged us to call a local autism non-profit organization for help with programs, additional resources, therapies, etc. (And, yes, it was our general pediatrician that worked with us. We do not have a neurologist, or a behavioral pediatrician, or a psychologist. We just have our amazing general pediatrician and for that we will be forever grateful to him!) It took me a year to make the call but finally, this is how we found the ABA program that changed our lives! Yes, applied behavior analysis (ABA). It POSITIVELY changed our lives. What I loved about our experience with ABA was that it “merged group instruction with guided observation, one-on-one sessions with the client and coaching of the parent or other caregiver. Parent training was not just about teaching skills to the child, but teaching us parent how to best understand the child and the nature of their disability.” (learn more about Easter Seals Midwest and their programs here. ) I got to practice what we were learning right along with my son. Together! For two weeks my husband and I were coached, supported, and encouraged by our certified trainers. It truly was a mindfulness-based parenting approach in an ADAPT (Active Discovery and Participation through Technology) type model. I learned to really see my son and learned how he processed things. Our communication was immediately improved. This program taught us HOW best to communicate with Henry and in turn, he learned how to communicate with us! Easter Seals Midwest’s program most certainly went beyond discrete trial teaching! (learn more about ABA and discrete trial teaching here.) Once we were able to communicate, Henry’s world began to open up to us and our world opened to him! It was, and still is, hard work. It takes continual practice but with this we’ve been able to slowly generalize these skills into everyday settings. We are almost 5 years out from our initial 2-week parent training. Henry has been in mainstream school since Kindergarten and is going into 4th grade in the fall. Henry has autism. He will always have autism. That’s a part of who he is and we never want to change him into someone he is not. What we want for him is to be the very best Henry he can be. As he grows up, there will always be new challenges, new anxieties, new difficulties in his path. Because of what all three of us learned in parent training, Henry is not just aware of his feelings but can identify them and verbalize them. He has acquired wonderful coping and communication skills, all which continue to evolve. He is able to adapt and generalize these skills into his every day life and learning. He is happy. He is healthy. And he has very proud parents that are positive of his success! 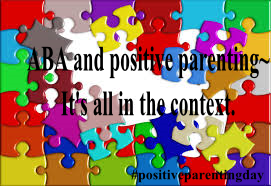 ABA and positive parenting~it truly is what’s inside the program and inside us that makes all the difference. This past Friday my kids had a half day for their last day of school. To celebrate I offered to take them out to lunch. After minimal debate and a 2 out of 3 challenge of rock-paper-scissors, Culver’s was the winning choice. As we sat and chatted about the last day and plans for the summer, a mom at a nearby table with a young girl and boy were enjoying lunch as well. Both children were very well-behaved. They were slowly finishing up and as they were gathering their things to leave, the little boy darted over toward our table and plucked a french fry from Henry’s tray and popped it in his mouth. I was immediately grinning, trying to reassure a stricken Henry that we did, in fact, have plenty of french fries to share. The other mom looked horrified and immediately started apologizing even though I told her it was really ok. We understood because we like french fries too! Henry was on it and quickly offered him two more fries which the boy happily gobbled up. This mom looked so relieved and we struck up a brief conversation about kids, picky eaters, french fries and ice cream. I mean, we were at Culver’s after all. I totally get it! I was so proud of Henry handling this situation with such grace. This had the potential of throwing my boy for quite a loop! Henry not only held it together but was able to turn his shock of a stranger grabbing food off of his plate into generously sharing with this boy! After we left, I began to wonder, if there was some kind of moms-of-special needs-kids connection that this other mom sensed. You see, her boy had several characteristics of having Down syndrome. While you can’t always “see” Henry’s autism, it is obvious that something is a bit different in his speech and mannerisms if you watch and listen to him long enough. Had she noticed? I admit I had been watching this other family all the while we were there. I was impressed how self-sufficient that young boy was; eating neatly, cleaning up after himself. All under the careful watch and only minimal instruction from his mother. Now I wonder if that mother had been watching us too. (Obviously, her little boy had been. Well, at least our fries were in his sights.) Usually I don’t concern myself with what other people think, though I do want to always want my kids to show good manners and courtesy toward others! I can only hope we left as positive an impression on her as they left on me! And they like french fries and frozen custard! That must mean they are good people! Right?! ?